Pocket Zombies. My personal history with these guys can be taken two ways, I guess. One way to view my excitement and anticipation would be to say that Atomfreak Studios has much to live up to. The other would be that my mind was already made up and that I would love these little guys regardless of how they turned out. Personally, I think it would be the former. The concept images were a fun and fresh take on our favorite subject and left my expectations high for their debut. Besides, as a family man who's children enjoy sharing dad's enthusiasm for zombies, they were definitely a welcome change from the norm. Don't get me wrong, I have proclaimed Sideshow Collectibles' in-house The Dead line as the best zombie toys on the market. But a cutely gruesome zombie that is suitable for the eyes of children while still appealing to the adult collector is hard to not like. On a side note, my daughter who will be two in March said "zombie" for the first time while looking at these guys. A proud moment for daddy, indeed. After drooling over the 3D computer images of Ted-E, I pretty much knew what he looked like. Once he arrived, he looked exactly like those images. There were no surprises. Well... there are, but I'll get to that later. His smile, clothes, skin tones, and posture were exactly as great-looking as the concepts. So, if you don't like the images you've seen up to now you won't like the finished product. If, like me, you have enjoyed the images you have seen he is a must-buy. Sculpting details are great for a toy of this type. Stitches, skin imperfections, hair details, and clothing all have the sculpted details they need. Paint applications are clean with minimal, if any, bleeding. There are some nice touches to the paint applications as well. Ted-E's white shirt isn't pure white, but rather, has the appearance of being dirty. The same goes for his jeans as the bottom of them are darker and dirtier than the rest. The packaging is great, too. He arrives in a colorfully decorated window box that reminds me of the days of grabbing for a toy off of the shelf. Ted-E is featured on the box cut-out while his toy counterpart is behind the clear plastic begging to be played with. Of course, the back of the box features the other two characters available from this series. Inside the box, you will not only find Ted-E, but also the "surprise" I mentioned earlier. Ted-E arrives with his very own collector card and some flies. I thought the flies were a great touch. And if you are wondering why, head over to the Pocket Zombies site and you will know the answer. But even these little flies have the same great unique qualities as Ted-E himself. They are sculpted with a great caricature quality having one eye larger than the other. What I found even more incredible is that the flies had three different sculpts to them! It's one thing to add something little like that but going all-out by including different sculpts for little flies as accessories is just an awesome touch. So what did I not like about this little guy? Not a whole lot. 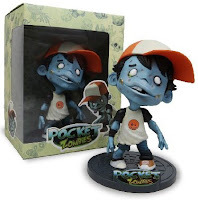 At first, I wasn't a huge fan of the printed "Pocket Zombies" logo on the base. However, after discovering that it was not a sticker and was actually screened on, my opinion changed. Personally being a primary collector of limited, numbered statues and busts, I thought it would be nice to know if there was a set edition size for these guys. Again, this doesn't really bother me as he is a toy or "art collectible" and the majority of art collectibles are not numbered. In fact, I think I only have one that is and that's the Mark Ryden YHWH piece. I guess it would be possible to complain about the lack of articulation. While I mostly prefer non-poseable statue type collectibles, some may prefer to have toys with more pose-ability. But again, that's just a preference. The bottom line? If you enjoy the images of the character's design, buy it. There are no surprises. At $35, this is a relatively inexpensive toy. Not that I condone purchasing anything for the investment aspect, but if series one, "The Family", does well we can expect to see future installments. I'm not exactly sure what creator, Alex Rodrigue of Atomfreak Studios, has in store but I do know that plans are in motion and other character designs are completed. This is a fun toy that can be displayed in various places in your home without worry of freaking out children and neighbors.